Yoga Habit teacher Lindsay O'Brien takes us inside her delicious-meal-filled life. By Mary Clare Fischer·	 4/11/2019, 8:30 a.m.
What I do: I work in Drexel University’s Office of Equality and Diversity as an equal opportunity and Title IX investigator and deputy equal opportunity/Title IX coordinator. I am also a yoga instructor at Yoga Habit in Fairmount. What role healthy living plays in my life: Fitness and health are extremely important to me and are the motivating forces in my life that drive me forward every single day. I am so grateful for all of the inspiring instructors that we have in this city and the community at Yoga Habit, where I teach. Over the past few months I have developed a mindfulness practice. I start each day by meditating and try to incorporate mindfulness into the rest of my day. Being active, eating well and meditating all contribute to my ability to lead a happy, healthy, and productive life. 7:30 a.m. — I was in Florida for the weekend and didn’t get home until 3 a.m., so I let myself sleep in later than usual. I start my day by making myself some hot water with lemon and sitting down to meditate for 15 minutes. This week I am listening to a guided meditation series from the 10% Happier app called “On the Go,” which is about bringing more mindfulness into everyday life. I’ve gotten into the routine of meditating every morning, and I really like the tone that it sets for my day. 8 a.m. — I slice some peppers, toss them with olive oil and garlic, and put them in the oven to roast. I take a shower and get ready for work. 8:30 a.m. — Fortunately, I’m going into work late today, so I have time to do a quick meal prep. 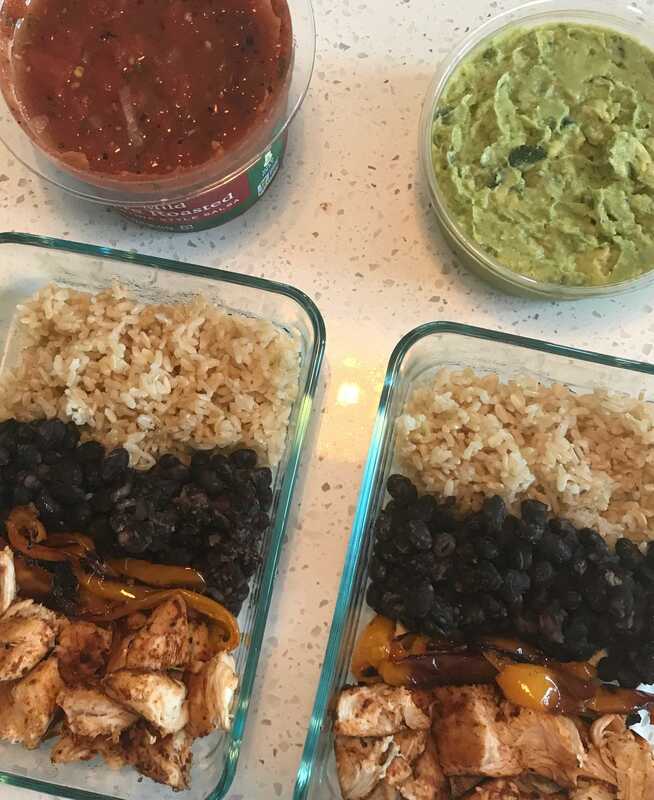 I grill some chicken strips, cook black beans, microwave some rice from the freezer, and construct fajita bowls. Then I make myself my favorite green smoothie and head to work. The song “Eye of The Tiger” is playing when I get in the car, and it feels appropriate because I have a lot to get done today. Bring it on! 9:15 a.m. — I sit down at my desk, read and respond to emails, and organize myself for the day. 10:45 a.m. — I need some caffeine since I am running on about five hours of sleep. I take a walk to Saxbys and order a small vanilla soy latte and avocado toast ($8.21). I walk back to work in time for a meeting. 12:45 p.m. — I have one of the fajita bowls that I made, which I toss together with salsa and guacamole. 2:45 p.m. — Time for a bowl of cottage cheese with pineapple before I head into a long meeting. 5 p.m. — We take a break, thank God. I stretch my legs and eat a Paleo Cave Man dark chocolate almond coconut snack bar. I’ve found that I need to eat every couple of hours since I became pregnant, or else I don’t feel good. 6:15 p.m. — My meeting is over, and I head to Whole Foods Market to pick up the rest of the groceries I need for the week. I have a coconut water while I shop to stay hydrated. 7:30 p.m. — I put away groceries and start to cook dinner, snacking on Mary’s Gone Crackers and everything-bagel-flavored hummus. 8:15 p.m. — My husband finally graces me with his presence, and we sit down to eat: salmon baked with mustard and honey, Brussels sprouts with bacon and cashews, and Parmesan cauliflower rice. 9 p.m. — We hang on the couch and watch TV for a bit before going to bed. I have a sweet tooth and am still a little hungry, so I have an Alden’s Organics ice cream sandwich. 5 a.m. — I wake up, make hot water with lemon, and sit down to meditate. 5:30 a.m. — I put on workout clothes and head to SoulCycle. I take Ryan Lewis’ 6 a.m. class ($32), and his theme and playlist are both great as usual. He plays everything from Maggie Rogers to Nappy Roots and talks about the importance of taking time to listen to your inner voice instead of always filling the space with noise. Great start to the day. 7 a.m. — I head home, shower, and get ready for work. I make myself a green smoothie and avocado toast (with everything but the bagel spice, red pepper flakes, and olive oil drizzled on top) and head to work. 9 a.m. — I have the avocado toast at my desk as I go through emails and prepare for meetings. 10 a.m. — I go into another long meeting. 11:15 a.m. — I have another Paleo Caveman snack bar during a break. 12:30 p.m. — My meeting ends, and I have my standard meal-prepped fajita bowl tossed with salsa and guac at my desk. 2:30 p.m. — I am starting to drag and need an energy boost. My co-worker and I take a walk to Saxbys, and I order an iced vanilla almond milk latte ($5.62). 4:15 p.m. — I have some Greek yogurt with strawberries and granola and work for another 45 minutes. I am subbing the 6 p.m. class at Yoga Habit tonight, so I hurry home to change into workout clothes and head to the studio. 7:30 p.m. — I am on my own for dinner tonight. I make myself a stir fry, inspired by what I would order from Honeygrow: brown rice, shrimp, mushrooms, broccoli, and pineapple tossed in a spicy soy marinade with sesame seeds sprinkled on top. Really easy and really good. 8:30 p.m. — I’m super energized and finally get around to unpacking from the weekend, going through mail and cleaning/organizing my house. 10 p.m. — I start to wind down for the night and am looking at social media. I am constantly being targeted with ads for baby stuff, and I see that Old Navy has some really cute baby clothes and everything is 40 percent off. I cave and order a few things. 6 a.m. — Standard morning routine of hot water with lemon and meditation. 6:30 a.m. — I continue on the cleaning/organizing spree I started the night before. Nesting is real. I feel like in a few months I will never have time to organize my kitchen cabinets again, so I better do it now! 7:45 a.m. — I make coffee smoothies for my husband and I (cold brew, frozen bananas, peanut butter, cinnamon, and agave nectar) and start a load of laundry. 8 a.m. — I am working from home today, so I sit down at my kitchen island and start going through emails. 10:30 a.m. — I make myself some avocado toast and scrambled eggs. 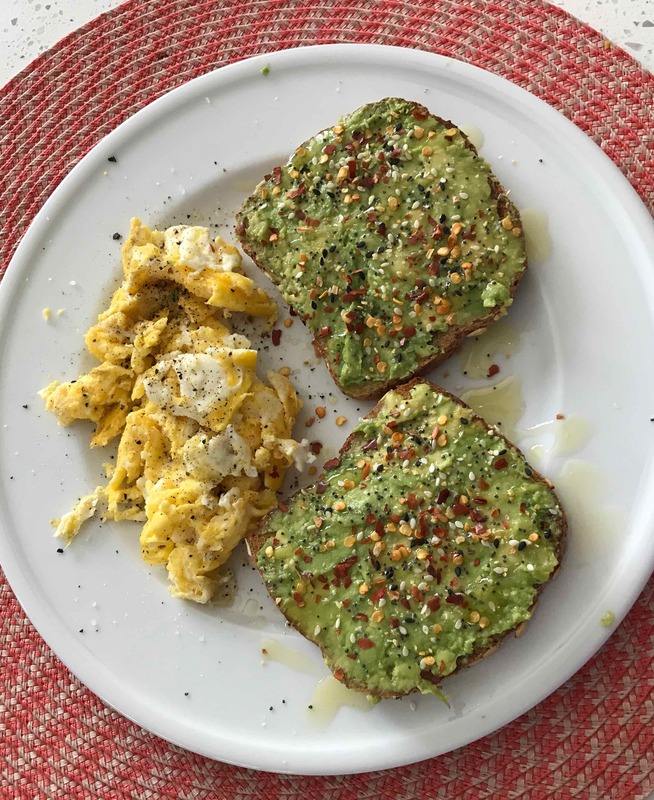 I top the avocado toast with the eggs and pour Hank’s Cilanktro Hot Sauce on top (Hank’s is a staple in our house, and this kind is the best). I get back to work typing up a report. 1 p.m. — I realize I haven’t eaten lunch and have some cottage cheese and mixed fruit while on a conference call. 2:45 p.m. — I eat the leftovers of the stir fry I made last night and get back to work. 4:45 p.m. — I’m heading to class at Three Queens Yoga and realize I’m dragging. I pick up a “PB Powerhouse” smoothie from Di Bruno Bros. ($7) on the way. It is so good (banana, peanut butter powder, almond milk, dates, cinnamon, and chia seeds), and it gives me the energy boost I need before class. 5 p.m. — I am taking Kasey’s Basics class, which I booked through ClassPass. The Basics classes at Three Queens are perfect for me right now because all of the teachers offer modifications for pregnancy, but they’re still alignment-focused. Normally, I am a power yoga junky — I love pushing myself to the next level of my practice and getting in a good sweat on my mat — but since I am pregnant, increasing my internal body temperature while practicing in a hot room is not ideal. 7 p.m. — I go over to my sister’s house to have dinner with her and my mom, and they are just finishing cooking when I get there. Dinner is chicken thighs in a Mexican marinade, couscous with pine nuts and a veggie tray. My sister makes the BEST veggie trays. 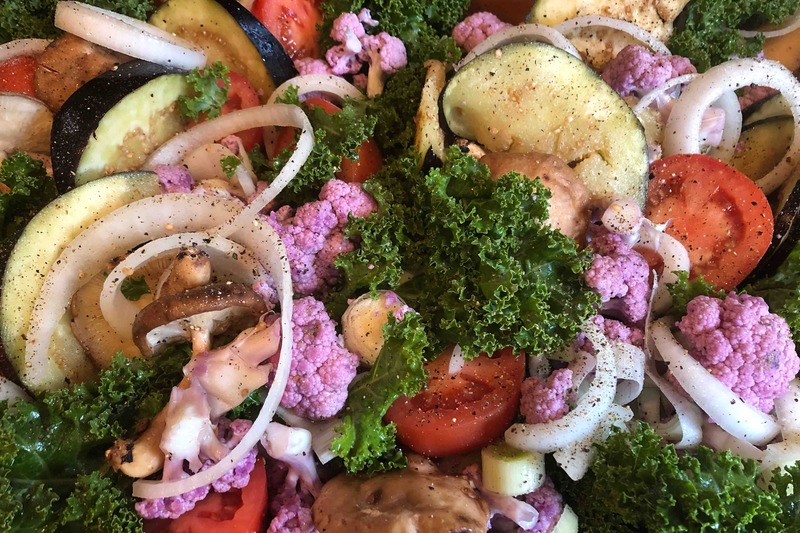 She cuts up a bunch of veggies — tonight it’s eggplant, onions, cauliflower, tomatoes, leeks, and kale — tosses them with coconut oil and garlic, spreads everything out on a tray, and bakes it in the oven. So good. 9 p.m. — I get home and basically go straight to bed. I’m exhausted, but I sign up for Ryan Lewis’ 6 a.m. class again anyway. 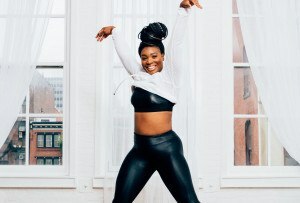 I usually don’t do two SoulCycle classes in a week (because it’s expensive! ), but I want to work out tomorrow, and this is what’s going to motivate me to do it. Good night! 4:30 a.m. — I’m awake and can’t get back to sleep. I’m also hungry (because pregnancy), so I get up and make myself a bowl of Rice Chex with vanilla pea milk and strawberries. Pea milk has a ton of calcium, which is important when you’re pregnant, and it’s pretty good. 5 a.m. — I meditate, clean up my kitchen, put some laundry away, change into workout clothes, and head to SoulCycle. 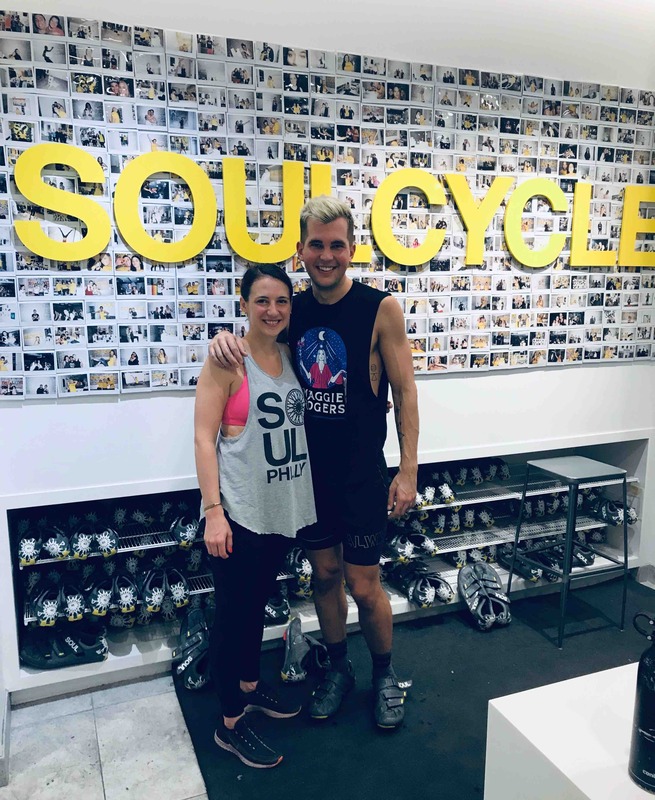 6 a.m. — Another great SoulCycle class ($32). I was tired going into it, but now I’m awake and ready for the day. 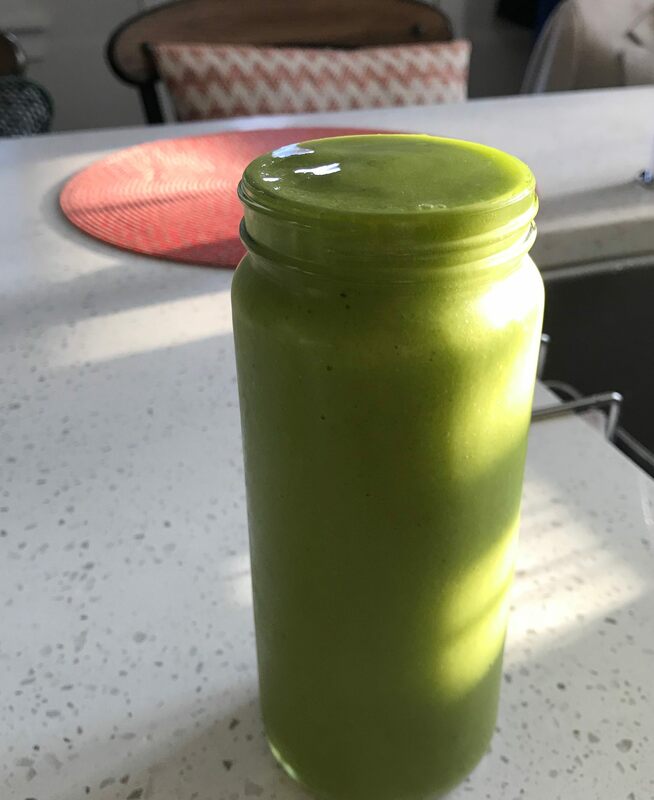 7 a.m. — I shower, get ready for work, make myself a green smoothie with frozen mango, and head to work. 9:45 a.m. — I’m hungry again, so I walk to Saxbys and order a vanilla almond milk latte and a “Funky Monkey” toast (whole wheat with banana slices, cinnamon, chia seeds, and honey) ($7.94). 10 a.m. — I start a string of meetings that goes until 1 p.m.
1:15 p.m. — I heat up some of the leftovers from my sister’s house last night and continue working. 4 p.m. — I eat some cottage cheese and fruit for a snack. 5:30 p.m. — I am on my way home when my friend calls to see if I want to go to dinner outside somewhere in Fairmount because it is beautiful out. I am easily convinced. We head to La Calaca Feliz, a neighborhood favorite, and get a table on the back patio. 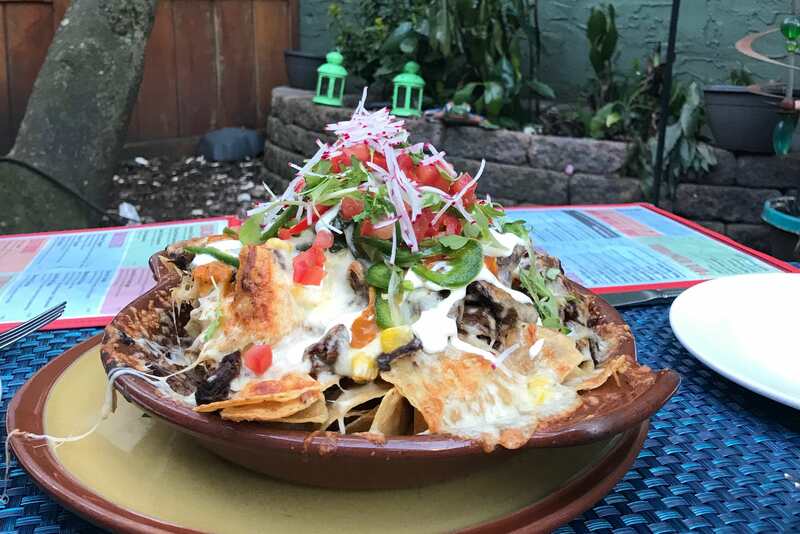 We order the house nachos with short rib (these are AMAZING), and I get a virgin passionfruit margarita with salt on the rim ($15). I have been all about mocktails since getting pregnant, and this one is great. 7:45 p.m. — I settle in at home on the couch and start watching the season finale of This Is Us, since I missed it on Tuesday. I am exhausted and fall asleep on the couch before it’s over. 9 p.m. — I get into bed and call it a night. 5:20 a.m. — I jump out of bed, realizing I slept through my alarm, which went off at 5. I quickly get ready and drive to Yoga Habit, which is only a couple minutes from my house. 6 a.m. — I teach a pretty full class of mostly regulars and head home. 7:10 a.m. — I take a quick shower and get ready for work. I make myself a green smoothie, this time with peaches and raspberries instead of pineapple, and avocado toast with tomato to go. I head to work. 8:15 a.m. — I listen to the new Sara Bareilles album at my desk while I check email and eat my avocado toast. 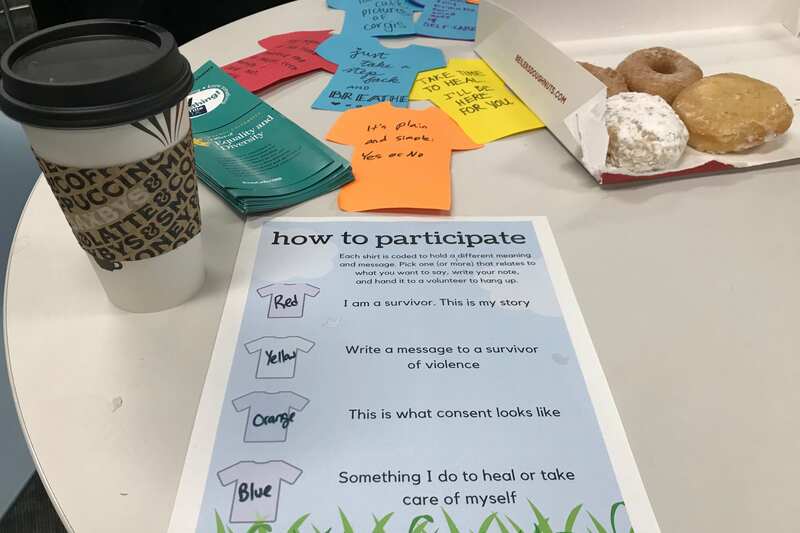 10 a.m. — I pick up a vanilla almond milk latte from Saxbys ($5.62) and head to Drexel’s Lindy Center, where my colleague is putting on an event for Sexual Assault Awareness Month. They have free Beiler’s Doughnuts, it’s Friday, and I’m pregnant… so I’m having one. 12:30 p.m. — I have more chicken and veggie tray leftovers and some cottage cheese with fruit for lunch. 3 p.m. — I’m snacking on dried mangoes as I work. 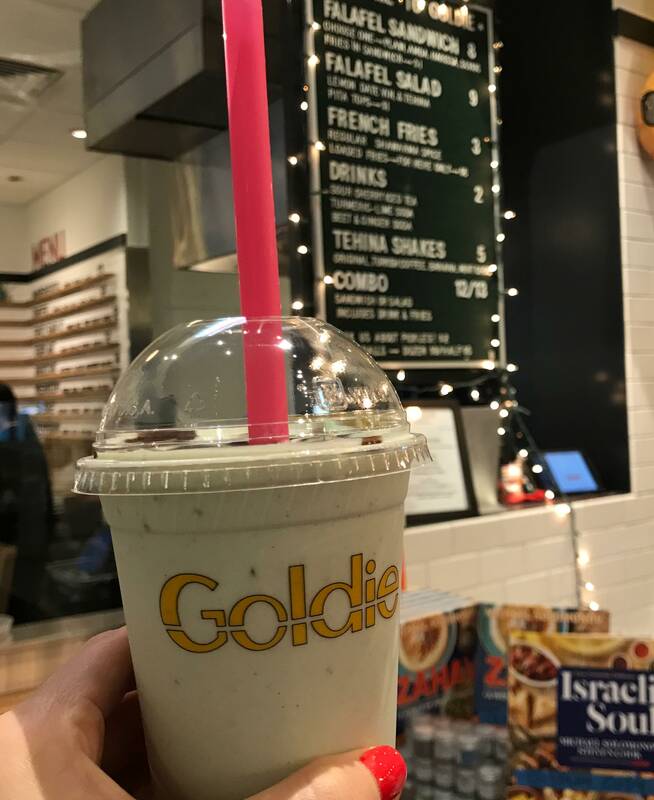 4 p.m. — I walk to Franklin’s Table food hall and order a mint chocolate chip tehina shake from Goldie ($5.75), head back to work, and finish what I need to get done for the week. 5:15 p.m. — It’s the weekend! I listen to Oprah’s Master Class podcast with Whoopi Goldberg on my way home. I get home and change into sweats for a Friday night in (which I am very excited about!). 6 p.m. — I remember I haven’t meditated today, so I do so for 15 minutes. Then I finish watching the season finale of This Is Us and have all the feels. 8 p.m. — My husband makes barbecue chicken pizza, and we settle in on the couch and turn on the movie Ghost, which I want to watch again since Whoopi was talking about it on the podcast. Of course I fall asleep on the couch about halfway through. 9 p.m. — I make my way into my room and call it a night.